RCBU trainees are active members of the greater Rochester community, and regularly share their work with audiences of all ages. Through a series of demonstrations, RCBU students share the science of waves on a string, introducing how concepts like amplitude and frequency determine the sounds that we hear. A vibrating Chladni plate helps to visualize how standing waves can be used to move colorful sand into complex patterns. For a more hands-on demonstration, kids have the opportunity to make their own waves using giant Slinkys, and they always have a blast teaching graduate students their own lesson: just how tangled a Slinky can really get! The team of RCBU student members (Emma Grygotis Norris, Melinda Vander Horst, Sarah Wayson) have featured these demonstrations at a variety of events including the IMAGINE fair hosted at Honeoye Falls Manor Intermediate School. Members of the Biomedical Engineering Graduate Student Council, including RCBU student member Melinda Vander Horst (BME doctoral student), organized the trip, which brought together graduate students from across the UR BME department to feature hands-on learning experiences in the fair’s engineering wing. Hundreds of second through fifth-graders had the opportunity to explore concepts across physics, optics, robotics and acoustics through exciting and educational demonstrations that introduced them to new ideas and activities, inspiring them to explore the world beyond their classwork. 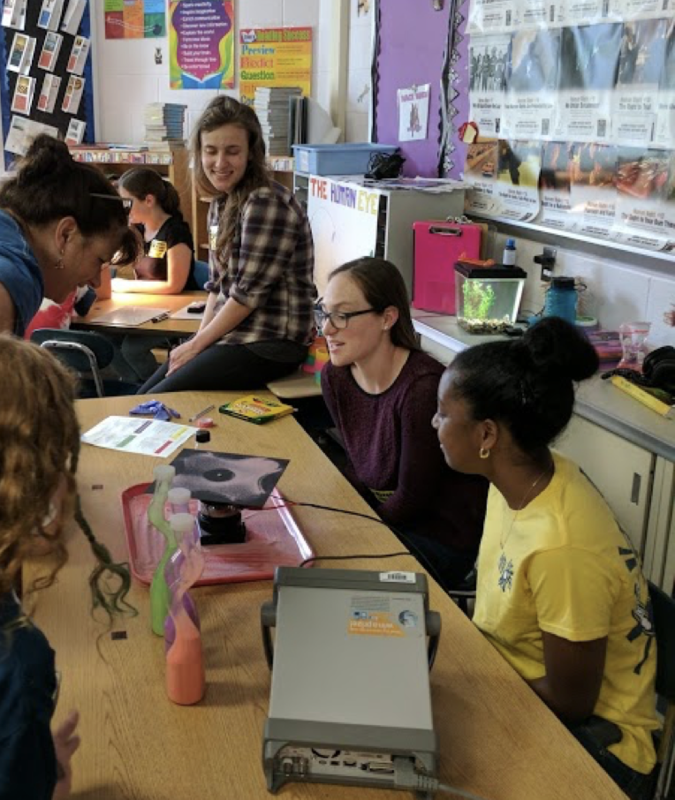 Emma Grygotis Norris, Haley Bertrand, and Dominique James (left to right) demonstrate standing wave fields for elementary school students at the IMAGINE Fair hosted at a local elementary school. 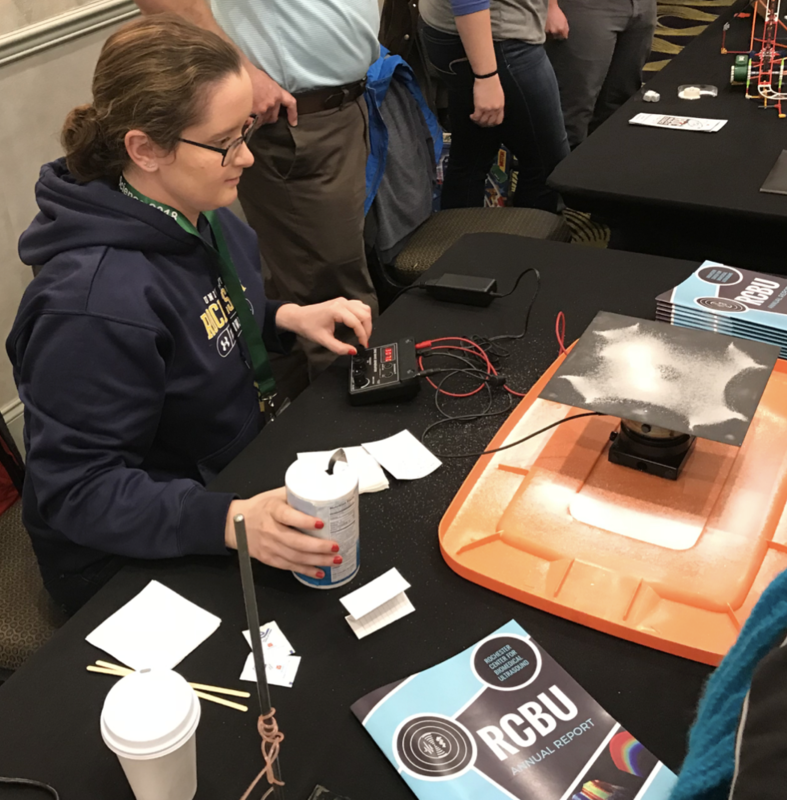 RCBU members also participated in both the first and second annual Rochester Science Expo, alongside presenters from area schools, local businesses, and educational organizations. In addition to standing wave field demonstrations, the events also featured Professor Denise Hocking, who prepared an interactive exhibit on the science of beer brewing and yeast biology, and Professor Diane Dalecki, who discussed the many ways advances in biomedical engineering benefit us all. The events were hosted by the Rochester NY March for Science, a non-profit educational and advocacy organization co-founded by RCBU student member Emma Grygotis Norris (Pharmacology and Physiology doctoral student), alongside fellow researchers, educators and parents from the Rochester area, all passionate about creating informal opportunities for scientists and creators of all ages to share their work. Sarah Wayson demonstrates vibrations on a Chaldni plate at the 2018 Rochester Science Expo. For high school students, actively considering the many career options available to them, the path to becoming a scientist can seem a daunting one. RCBU student member Sarah Wayson (BME doctoral program) was invited to give an alumna lecture to high school seniors at Tioga Central High School’s Leadership Week in Tioga Center, New York. Sarah introduced her motivation for pursuing a career in biomedical engineering, and her academic path to becoming a doctoral student. She shared her experiences studying engineering in college, and strategies for overcoming challenges along the way. She emphasized the importance of informational interviews, job shadowing, and creating a network for students interested in pursuing careers in science and engineering. Students ended with a conversation about effective leadership qualities. These events are wonderful opportunities for RCBU members to step outside the lab and become better communicators. 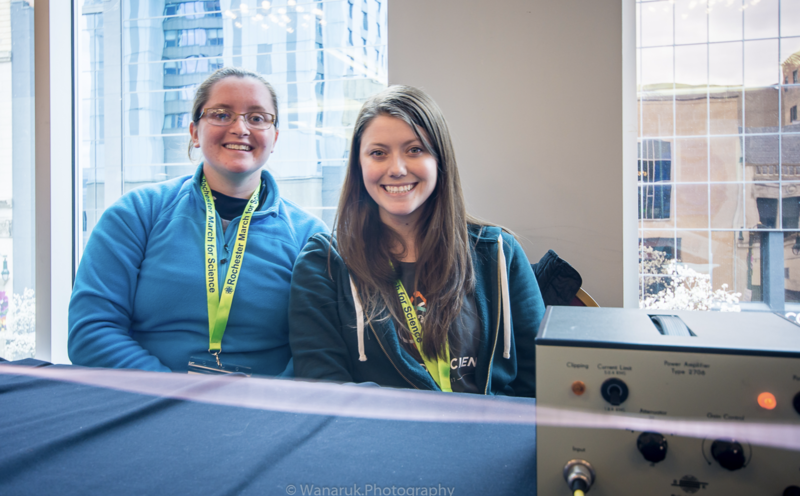 They are a chance to share their enthusiasm for biomedical ultrasound and acoustics with science enthusiasts of all ages, and to inspire others to use the tools of science to solve problems big and small. 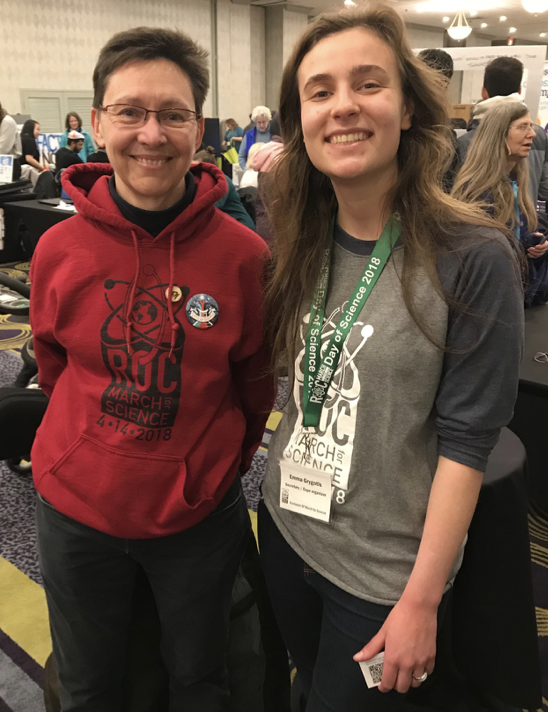 Emma Grygotis Norris (right), organizer of the Rochester Science Expo, and Denise Hocking (left) at the Rochester Science Expo.